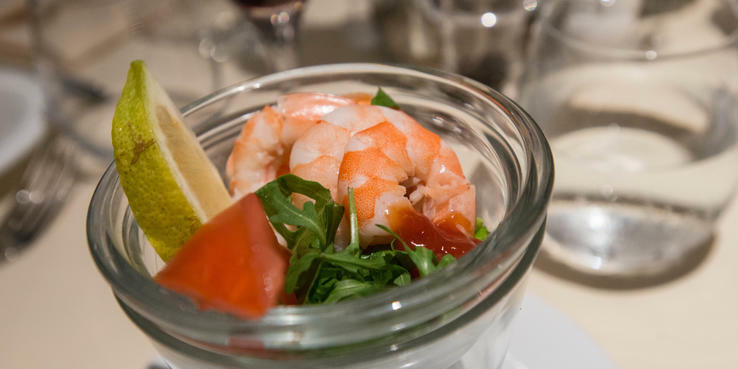 Food aboard MSC Seaside is generally enjoyable, with dishes focusing heavily on meats, fish and homemade pasta. Dishes tend to be small but filling, leaving you feeling satisfied but not overfed. In true European style, expect meals in the dining rooms and alternative restaurants to be long, drawn-out affairs, sometimes taking between two and three hours. The Seashore Restaurant is open every day for breakfast, for lunch on sea days only and for dinner every night, in three set seatings, though passengers who choose MSC's flexible My Choice dining can eat dinner at Seashore any time between 5:30 and 9:30 p.m.
Ipanema is open nightly for dinner only. It shares a menu with Seashore and also has three set seatings. Both offer sea views through large windows. Tables seat anywhere from two to 10 people. Chef's selections are noted on the menu, and a "Classic Favorites" section features a variety of items for picky eaters. Extra-fee items are also offered, each with one free side. Service in the main dining room is generally efficient but not overly engaging. MSC Seaside has two onboard buffets: Marketplace, the main buffet near the ship's outdoor promenade, and Biscayne Bay, a smaller and more family-friendly buffet near the ship's main pool area. Both buffets are open for breakfast and lunch daily, with virtually identical offerings, but only Marketplace is open for dinner each night. Both are also open during select between-meal hours to offer pizza and grill items. Additionally, Marketplace does afternoon and midnight snacks like sandwiches and cookies. An out-of-this-world standout is the ship's buffet pizza, which is made fresh throughout the day. Both buffets offer indoor and outdoor seating. Note that passengers cannot access the Biscayne Bay Buffet from the forward end of Deck 16. It can only be accessed from the aft elevator bank and stairs, so anyone already on Deck 16 but at the front, will need to go down a deck, walk toward the back of the ship and then go back up. This restaurant is restricted to and complimentary for passengers booked in the MSC Yacht Club. The space is set on a balcony overlooking the club's private Top Sail Lounge on Deck 16. Tables accommodate between two and 10 passengers. The menu varies daily but is different from what passengers get in the main dining rooms; it often features higher cuts of meat than what you'd find elsewhere. Pricing was accurate at the time of review but might have changed since. Headed by renowned chef Roy Yamaguchi, Asian Market Kitchen is a trio of Asian dining options including Kaito Teppanyaki (with four menu choices), a sushi bar and Hawaiian-influenced pan-Asian cuisine. The sushi and pan-Asian eateries share one space, with all items printed on one menu. For the Pan-Asian choices, there's also a prix fixe dining package that lets you choose three dishes from a smaller menu for $35. Service is attentive and friendly. This bright eatery with a nautical but classy theme was the most pleasant culinary surprise of the sailing for us. The prix fixe dinner option entitles diners to one dish from each section of the multicourse menu, up to a maximum of three dishes. (Several of the higher-priced menu items are not included in the prix fixe menu.) Or, you can order a la carte. Tip: Book a table for lunch for gorgeous sea views. The menu is extensive at this fine dining steakhouse. The prix fixe option lets you choose up to three dishes, but no more than one from any given section, or you can order a la carte. We had no complaints about the food and left feeling completely stuffed. Brunch is served at Butcher's Cut on sea days. All items range from $5 to $8; there's no prix fixe brunch. Through a linkup with Italian chocolatier Venchi, MSC offers two outposts for anyone with a sweet tooth. The cioccogelateria and coffee bar indoors on Deck 6 features gelato, specialty coffee drinks, milkshakes, sweet alcoholic drinks, Italian hot chocolate and chocolate by the pound. The gelateria and creperie, found outdoors on Deck 7, serves crepes, milkshakes, waffles and ice cream.